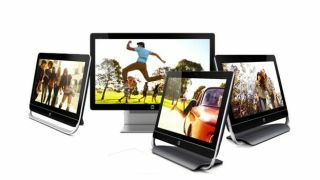 Hewlett Packard announced four new all-in-one PCs to launch alongside Windows 8 this year. The flagship of the new line is the Spectre One - a 23.6-inch desktop that sports a sleek 11.5mm curved form to make it one of the slimmest all-in-one PCs around. The Spectre One makes some sacrifices for the sake of its aesthetics, lacking features like an optical drive and even a touch screen despite being billed as a Windows 8 desktop. To compensate for the lack of a touch display, HP is including a wireless multi-touch trackpad to act as a proxy without smudging up the screen. It also packs an Intel Ivy Bridge CPU, 1GB NVIDIA graphics card, Beats Audio, two USB 2.0 ports, two USB 3.0 ports, an HDMI-in port, and most interestingly, NFC support. Users will be able to log into Windows 8 with a simple tap of their NFC-capable smartphone and easily sync and stream files between their handset and desktop. HP also has three more all-in-ones in store for Windows 8 with the HP Envy 23, Envy 20 Touchsmart, and HP Pavilion 20. The two HP Envy desktops will be 20- and 23-inch models with full touchscreen displays to take advantage of the new Windows 8 user interface. They'll be equipped with Intel Ivy Bridge processors and arrive on store shelves in October priced at $799 and $999 respectively. The Pavilion 20 will be HP's budget all-in-one PC, forgoing a touchscreen on its 20-inch display and shipping in October for $449. The stylish Spectre One will arrive later than the others, missing the launch of Windows 8 with a scheduled November launch. It will set you back $1,299, and may just usher in a new wave of NFC-capable desktops.